you deigned to enrich your Church with the many gifts of the saints of the Order of Preachers. may follow in their footsteps and join the in the eternal festival of heaven. One night, after prolonging his prayers until midnight, Dominic left the church and came to the dormitory, where he completed what he had to do and, taking his place at one end of the dormitory, continued to pray. As he stood praying, he glanced at the other end of the dormitory and saw three beautiful women enter, but noticed that the one in the middle was a venerable lady far more beautiful and dignified than the other two. One of them was carrying a beautiful, shining vessel, and the other an aspersorium which she handed to the lady in the center, who went from bed to bed sprinkling the brethren with holy water and blessing them. As she went along in this way, she passed by one of them without sprinkling him or blessing him. Blessed Dominic observed this and took note of the brother they neglected. The lady said to blessed Dominic: “I am the one you call upon in the evening. When you say, Turn therefore most gracious advocate thine eyes of mercy toward us, I prostrate myself before my Son and ask him to preserve the Order.” After that Blessed Dominic inquired about the brother she had passed by as she had sprinkled and blessed all the others. “Because he was not properly disposed,” she said. After this she continued to sprinkle and bless all the others and then disappeared. When she was gone, Blessed Dominic returned to pray in the place he stood before. Suddenly he was rapt in spirit before God and saw Our Lord and the Blessed Virgin sitting at his right. It seemed to blessed Dominic that Our Lady was wearing a cape of bright blue, the colour of sapphire. As blessed Dominic looked around, he could see religious of all the orders but his own before the throne of God, so that he began to weep bitterly and stood far away, not daring to approach the Lord and His Mother. Then our Lady motioned for him to come near. But he would not dare, until Our Lord Himself also called him. Then blessed Dominic cast himself before them weeping bitterly. But our Lord told him to rise, and when he did, Our Lord asked him, “Why are you weeping so?” “I am weeping because I see all other orders here but no sign of my own.” And the Lord said to him, “Do you want to see your Order?” and he answered, “Yes, Lord.” The Our Lord, putting his hand upon the shoulders of the Blessed Virgin, said to blessed Dominic, “I have entrusted your Order to my Mother.” Then the Blessed Virgin opened the cape which covered her and spread it out before blessed Dominic, to whom it seemed vast enough to cover the entire heaven and, under it, he saw a large multitude of his brethren. Then, prostrating himself, Blessed Dominic gave thanks to God and to Blessed Mary his Mother, After that the vision disappeared and he returned to himself just as the bell rang for Matins. When Matins was over, he called the brethren to chapter and gave them a long and beautiful talk, exhorting them to love and pay reverence to the Blessed Virgin Mary. Among other things he related this vision to them. 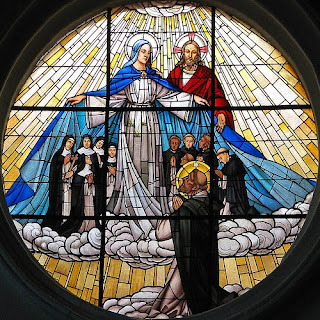 This vision blessed Dominic narrated to Sister Cecilia and the other sisters of San Sisto as though it had happened to someone else, but the brethren who were with him and heard it from his own lips implied to the sisters that it was he. All the above statements about blessed Dominic were made by Sister Cecilia, who testified so firmly to their truth that, if it were necessary to repeat them under oath, she would do so. But because she is such a holy and religious person and it is so easy to believe her simple words, this account which she gave from her own lips has been put in writing by Sister Angelica of the same convent of Saint Agnes for the honour and praise of Our Lord Jesus Christ, our Blessed Father Dominic and the consolation of the brethren. Pardon the style of the compiler, for she is woefully ignorant of grammar.